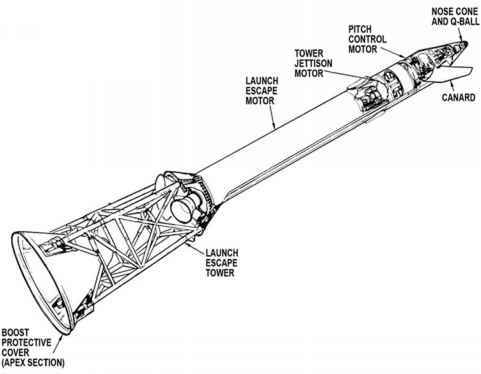 The precise time for the CSM to separate from the rest of the stack was not critical but, as was NASA's nature, they defined it as part of their carefully organised flight plan. The major constraint to this whole exercise was that the S-IVB had to be left with enough battery power for its final manoeuvres to steer away from the spacecraft's flight path. A one-hour event timer that was preset to read 59:30 was started 30 seconds before the planned moment of separation. Counting up, it reached zero at the point of separation, and helped the crew to coordinate activities with their checklist both before and after the key moment. The timer was often used in this way for critical events in the mission. With only 2 seconds remaining, the CMP, sat in the left couch, eased the translational hand controller in his left hand forwards, away from himself. At his command, rear-facing thrusters on the service module began to fire so that, as soon as the CSM became free, it would move away from the SLA. The separation itself was executed by a guarded pushbutton on the main display console. This switch was one of a group of eight such buttons that could be used to initiate pyrotechnic events, but it was the only one that was meant to be used during a normal mission; the others allowed backup manual control of events that normally occurred automatically. allowed to immediately drift free of the stage. Rather, each had two partial hinges mounted along its lower edge. The pyrotechnics also forced small pistons mounted in the lower section of the SLA to push on the outside edges of the panels, ensuring that they rotated away as desired. Moon system every few decades. Today there are as many as 36 SLA panels out there that will drift aimlessly for perhaps many thousands of years. In the fullness of time, some may re-enter the Earth's atmosphere and burn up, while others may be thrown into the deeper reaches of our solar system for eternity. _____ ______not used for the panels, engineers having chosen to keep them attached. 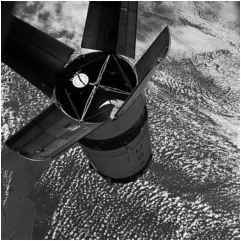 Ap°n° 7's S-IVB had no LM but included a As the CSM returned to the S-IVB to target for docking practise' manoeuvre near their mock docking target, the commander Wally Schirra observed how one of the panels had not properly deployed and was flexing uncomfortably close to where they intended to practise. His CMP Donn Eisele described the scene to mission control: "The SLA panel at the top, left and bottom are opened at [what] I would guess to be about a 45-degree angle, and the SLA panel on the right is just opened maybe 30 degrees at the very best.'' Schirra elaborated: "Except for that one panel, everything looks like it's just as you'd expect it to be on that S-IVB SLA deployment.'' Eventually, Schirra invoked the commander's prerogative and cancelled the docking practice. Instead, he elected to station-keep with the S-IVB. "We're a little worried to get backed up in there with that one cocked panel.'' Next day, when they rendezvoused once again with the S-IVB, the panel was found to have fully deployed, but the practice approach was not attempted.